This Three Position 6-Terminal Toggle Switch is available in momentary or constant and also with blade or screw terminals. The momentary version will only remain on when held in an on position and will return to the off position when released. The constant version will remain in an on or off position until changed by hand. This toggle switch is perfect for applications where reverse polarity at the flip of a switch is required. For example: using a dc powered motor. The motor can spin clockwise with the switch in "on" position 1 and spin counterclockwise with the switch in "on" position 2. See the knowledge base for information on correct wiring. 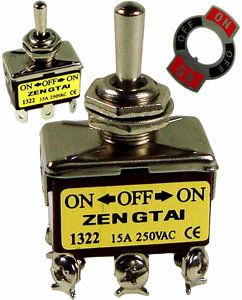 This toggle switch is also great for alternating power between two receiving locations. For example: two water pumps that need to be run at different times. Pump 1 would receive power from the toggle when in "on" position one. Pump 2 would receive power from the toggle when in "on" position two. Rock solid toggle switch. I've purchased these several times here and have never had a problem with the 6 leg toggle or receiving my order.